There’s something romantic about the idea of packing up and just leaving our problems and pasts behind; escaping to nature. Campo Santo’s Firewatch feels like a Romantic poem come to life. Its setting made me fantasize about visiting the Wyoming wilderness. 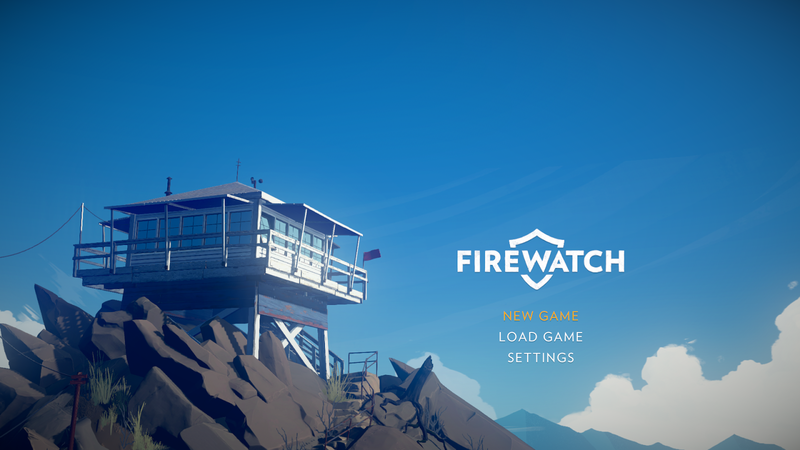 Firewatch presents the contrasting beauties of solitude and companionship in the great outdoors. It put me in a real-world fantasy and then made me question that very fantasy and what it means to escape. Firewatch begins with a text-based telling of Henry (voiced by Rich Sommer) and his wife’s relationship, from their meeting to years later when Henry sees an ad in the paper and leaves to become a fire lookout in the Shoshone National Forest. This intro is interspersed with snippets of the journey out to his post. “People take this job to get away from something,” Delilah (voiced by Cissy Jones), Henry’s supervisor and the only other voice in the game, says to him when he arrives on the first day. It’s true for the both of them. Henry’s wife was stricken with early-onset dementia. After struggling for years to take care of her, he leaves her with her family to take this job. Henry and his supervisor Delilah’s relationship and their pasts are Firewatch’s focal points, though they never meet. For the entire game the two of them communicate solely through radios, for they are stationed in different parts of the forest, and Henry attends to the various problems of the forest, such as some rowdy teens setting off fireworks. Firewatch’s subtle characterization of Henry is remarkable. He is not a young man, and it shows. He braces himself when he jumps down from a rock; he idly rubs the wedding ring he still wears. Henry always has the weight of his decisions on his mind, evident in his tendency to become distant when talking with Delilah. In many ways Firewatch is about dealing with the struggles of reaching middle age, deciding what direction the later part of your life should take. Henry is in the forest to escape from the responsibility of making that choice, and to escape his past. But he can’t; it’s always right there with him. Firewatch’s Wyoming setting is beautifully realized. Everywhere I went I marveled at the vistas, the trees, the ravines, and the lighting. The game has a sprint button, but I rarely used it. I wanted to enjoy every beautiful detail. Campo Santo, the studio who made Firewatch, was able to strike a unique balance between isolation and connection. Henry is always alone in the forest. He spends his days hiking it by himself, which gave me long stretches to think about his life and decisions. Chris Remo’s beautiful score accented many of these moments. Having played and loved his previous game, Gone Home, I could feel his unique musical touch here. The score transitions between ambient music and acoustic guitars that I wanted to listen to endlessly. In contrast to the solitude there are also long stretches where Henry and Delilah are talking. Firewatch often let me choose how Henry would respond to Delilah. Henry is a well-defined character, and the dialogue choices, rather than letting you completely mold a blank slate like in Fallout, allow you to gently push his character in certain directions. This mechanic encouraged me to identify with Henry. I often tried to imagine how he would respond, rather than what I wanted him to say. The arc of Henry and Delilah’s captivating relationship is expressed through how they talk to each other and what they talk about. They frequently talked of their pasts, but as they became more comfortable with each other subtle jokes or turns of phrase signaled their closeness. One day early on, there is a thunderstorm approaching and the two of them exchange the best, most cringe-worthy series of puns about lightning and electricity. Weeks later they are watching a fire late at night and Delilah says she is glad Henry is here, which is about as forward as either of them ever get. Every time they talked, every time they became a little closer, the times they mentioned the idea of seeing each other, I thought about how wrong the situation was. Henry just left his sick wife to come here. They both knew that. And yet, I understood the way their relationship progressed. It brought back sad memories of an almost-romance in my own life. Firewatch perfectly captured my memories of longing for the other person and thinking we would be so perfect together. One of the brilliant components of Henry and Delilah’s relationship is that, though they rarely talk about it directly, I could feel them becoming closer, opening up emotionally. The very human desire for companionship is so evident in both Henry and Delilah. They are each other’s only real connection in the vast Wyoming wilderness. Both of them ended up here at the end of previous romantic relationships. Firewatch had me struggling between wanting them to be together and knowing that they shouldn’t be. It felt so real, so nuanced. They aren’t even physically together. All they can do is talk over the radios, and so the story builds their relationship entirely on conversation and emotion. There is the sad realization that, had they met some other way, had their lives worked out differently, they could be happy and together. They find escape not just in the forest but in each other as well. And it is the very fact that they find an escape from their pasts in each other that they can’t be happy together. “Escaping isn’t always bad,” Delilah says at one point. But by the story’s end, it’s clear that isn’t true, or at least not for them. Coming to Wyoming didn’t make Henry or Delilah’s pasts go away. Firewatch’s story, written by Sean Vanaman and Chris Remo, argues that we can’t escape our pasts and our problems. Henry brings his unresolved problems and guilt into the forest. His presence there coincides with a fire they cannot put out. He uses nature not for its own beauty but as an escape and as such the problems he brings into the forest begin to destroy it. A third character in the game who refuses to leave the forest is presented as a painful look at what can happen should Henry refuse to ever confront his past. At one point in the game, Delilah asks him what his eyes are like. “They look tired I think,” Henry responded. “You hit a certain age and you think you’re a younger person who just looks tired.” Between the writing and the amazing performances, I grew to know Henry and Delilah on deeply personal levels.Their flaws and struggles made them incredibly relateable. Firewatch let me be with them in a beautiful place where so many go to forget. The brilliance of Firewatch is in the simplicity, almost mundanity, of its story. This isn’t about the end of the world, aliens, or a government conspiracy. This is simply about one summer when a man tried to make sense of life and figure out how to live with the decisions he’s made. I loved Firewatch for Henry and Delilah’s relationship, for the beauty of the game’s visuals and music; I will remember it for the nuanced way in which it dealt with the problems of our past. There’s no running away, it says, the best we can do is face them. Firewatch is available to download on PS4 and on Steam for both Windows and Mac starting Tuesday, February 9th. Hi there! My name is Kyle McKenney! I’m a part-time games journalist, YouTuber, and sophomore here! If you enjoyed this review, follow me on Twitter, @TotallyKyle95, and check out my YouTube Channel, Games With Friends, for my Let’s Plays, interviews, and more! I’m a part-time games journalist, YouTuber, and sophomore here! I have a passion for video games, comics, and nerd culture. I endeavor to write about these things from a feminist perspective, while bringing new games, comics, and stuff to people's attention.